A Disgruntled Republican in Nashville: How cost-burdend are Nashville renters? How do we compare to other Metro areas? How cost-burdend are Nashville renters? How do we compare to other Metro areas? There are more than 110 million renters in the US, and housing affordability is a major concern for many renters across the country. 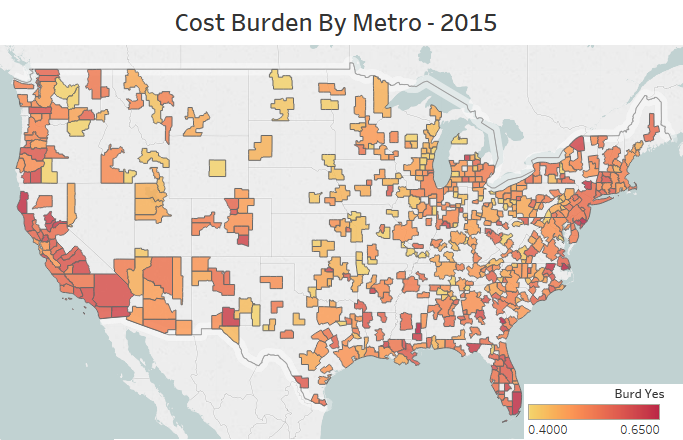 To better understand the challenges they face, we dug into Census data on renter cost burdens across the US. Nationwide, more than half of renters pay more than 30% of their income in rent. 46.3% of Nashville metro renters were cost-burdened in 2015, making it #21 for affordability out of the nation's top 100 largest metros. Affordability is driven by both rent and income; from 2005-2015, rents in Nashville increased by 14.3%, while renter incomes increased by 16.7%. Nationally, metros in the Midwest and Texas tend to have relatively low shares of cost-burdened renters, while metros in Florida and Southern California ranked worst for affordability. You can preview the full report at this link. We also have data from 2005-2015, for more than 450 metros across the US. Is this something that your audience might be interested in? You can find more of our analysis of rental price data and trends on our Rentonomics blog. If you have any questions, please don't hesitate to contact me at andrew@apartmentlist.com. Please note, that we are not getting worse, but are actually getting better. Incomes are increasing at a faster rate than rents. That is not the only measure of course. Not all incomes are rising at that rate. In my view, we would be better to focus on increasing incomes and lifting people out of poverty rather than attempting to force property owners to sell their product at a below market price. Fighting high rents by rent control is like fighting hunger by telling Krogers what prices they can charge for groceries. I own a rental property and if there was no profit in it then I'd sell the property to an owner occupant. This would shrink the number of rental units available. If a lot of people are doing the same then we'd have a major rental shortage. New York City is a good example of how rent control creates major problems with affordability.